When it comes to living your most healthy life you will always hear me say, “Food Comes First”. What we eat determines how healthy our body can be and it’s important that we feed ourselves in an effort to be our best. 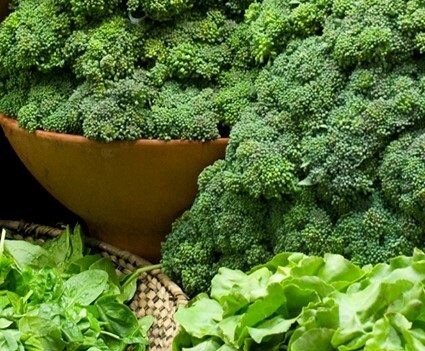 Food is medicine, there are key nutrients in every single healthy bite and one of the most important food groups comes from our veggies and in particular our greens! Studies show that certain greens can help protect us from diabetes, heart disease and even cancer while providing us a great source of fiber, minerals and important vitamins! I personally have greens in 3 of my meals everyday, and one of those meals is always a salad! Below are my Top 4 Greens for your salads! It’s important to point out that all of these greens can actually also be more healthy providing more nutrients when cooked, so they are not just for your salad. 1. Kale: Once considered the greatest wedding plate garnish the world over, we now know that this green is as nutrient powerhouse! Not only green, but any color kale will offer high amounts of vitamin A, C, and K as well as a great source of calcium and potassium. 2. Spinach: This has been a long time favorite for many people and the most common healthy green added to salads after your common lettuces. Spinach is high in vitamin A and C as well as folate. This green is also high in calcium and studies show that when you heat spinach it actually becomes a healthier green. 4. Parsley: Yup, parsley is going to make my Top 4 list. Considered an herb, often only used as a garnish, but if you haven’t tried it in a salad, you definitely should. Very high in vitamin A, C and potassium like most greens, but unlike most greens high in volatile oils and flavonoids which are high in antioxidants and have a ton of medicinal properties! Give these greens a try when cooking and always try to think of your food as the medicine that will help you to live your very best life! !